COCOLAMUS – Tuesday night at the East Juniata baseball diamond, the near impossible was almost made a reality as the Tigers baseball team battled back from a 10-run deficit to tie the game at 16, sending the game into extra innings. 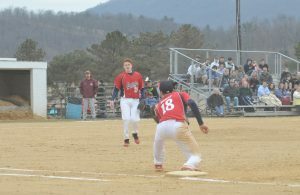 However, a Line Mountain run in the top of the eighth proved one run too many for East Juniata to overcome, falling 17-16 in Tri-Valley League action. Offensively, both teams combined for a total of 33 runs on 34 hits in the 2 hour and 45 minute contest. Highlighting the afternoon for the Tigers was a grand slam by first baseman Bailey Coder. Coder took a Corey Warfield offering deep into right centerfield, sparking the beginning of the East Juniata comeback attempt. Trailing 16-14 in the seventh inning, East Juniata seemed like a team possessed and they came up to the plate for its final at-bats. 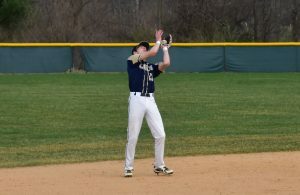 After holding the Eagles scoreless in the top of the final inning, the Tigers immediately went to work offensively. With one out, Kyle Hart took one for the team as he was hit by a Line Mountain offering. Coder, who finished with 5RBIs and a 3-for-5 evening, put runners on first and second after posting a single in between shortstop and third. Mason Hambright loaded the diamond reaching on a walk. An error by the Line Mountain third baseman allowed Hart to cut the Eagles lead and Chas Maguire to reach base. Terran Sheaffer sent the game into extras scoring Coder on a sacrifice fly. Unfortunately for the home team, Line Mountain was able to score on a Casey Paul walk and a 2-out RBI single by Kellen Musser. Teetering on the brink of being 10-runned in the bottom of the fifth, the Tigers used some patience at the plate to keep the game going. Leadoff hitter Jeremy Pannebaker roped a double to rightfield. Nick Lorenz follwed Pannebaker with a walk. With one out, Kyle Hart continued the inning, loading the bases on a skipper to centerfield. It was then Coder’s turn to keep the momentum going. With one giant crack of the bat, all the bases were cleared and the Tigers had cut the lead to 13-6. 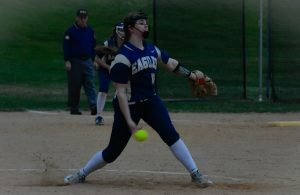 But that comeback attempt would only be temporary as the Eagles rallied for three more runs in the top of the sixth to extend its lead to 10-runs, 16-6. East Juniata showed that it wouldn’t go down without a fight and did just in their part of the sixth, cutting the deficit to just two runs thanks in part to an 8-run inning. In the bottom of the sixth, East Juniata started at the top of their line up as Nick Stahr got things going on a simple single to left. Pannebaker reached next on an error by Line Mountain, putting runners on the corners. Minutes later, Lorenz brought in Stahr on a sharp single to left. Dalton Rowe continued the rally plastering a gapper to left centerfield, scoring Pannebaker, making it 16-8. With one out, Coder was at it again, picking up another RBI on a sizzling single to leftfield. Hambright kept things moving along, picking up a base on balls, putting the bases loaded. An RBI double by Chas Maguire and then an RBI triple by Terran Sheaffer, put the Tigers within three at 16-13. East Juniata would get one run closer thanks to a sacrifice fly by Stahr, scoring Sheaffer and setting the stage for an exciting seventh inning. The Tigers will be back in action today as they travel to Newport.